Denver is the perfect place to start your RV rental vacation. Denver is an easy flight from nearly all locations with Denver International Airport typically being more direct and less expensive than other destinations. Leaving Denver there are dozens of RV vacation destinations within hours. From the Grand Canyon to Yellowstone to Mount Rushmore and all points in between, an RV Rental from B&B RV, Inc. will provide lasting memories. State Parks, National Parks and Monuments abound within a short distance of our full-service motorhome rental dealership. Traveling in a motorhome rental is easy and flexible. Because your RV is self contained, it allows you to stop where you want, when you want for as long as you want. However, during peak seasons and for very popular destinations, you will want to do more planning including campground reservations. A couple of handy RV trip planners to assist you with your RV vacation route and itinerary as well as to choose campgrounds are RV Parky, Campground Views, and RVTripWizard. For those of you who are new to RV travel, check out this RVing For Beginners Guide. 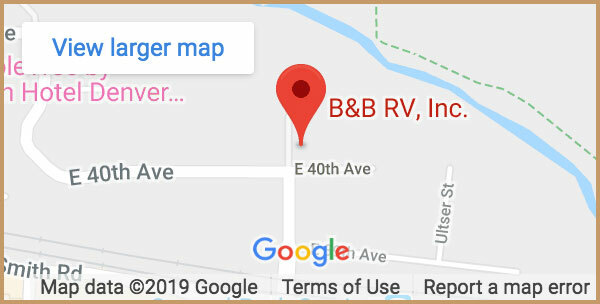 B&B RV, Inc. is the only Colorado RV Rental Dealer that is 5-Star certified by RVRD.org. Below is a collection of links to some of the most popular RV Rental Destinations from Denver, Colorado.